The magazine Architecture Boston has focused attention on the controversial aspects of Sert's work by devoting its July/August 2003 issue to an examination of Peabody Terrace, expressing the essential disagreement about the work in the form of a stark conundrum: "Architects love Peabody Terrace. The public hates it." 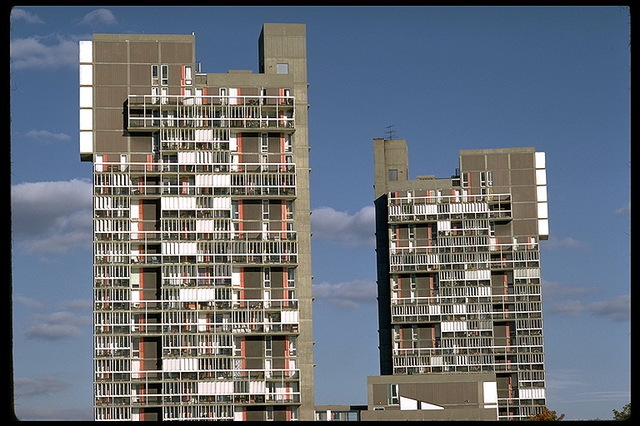 Otile McManus, in a companion essay, discusses the reactions of many Cambridge residents, who have described the complex as "monstrous," "cold," "uninviting," "overwhelming," and "hostile," and have compared it to Soviet housing. Actually, the most intense feeling were by those who lived there, who really, really hated it (though I will admit there were several third world students who loved it -- must have been nostalgic for them). The article goes on to accuse detractors of being anti-modernist. Which is a laugh, since my house is one of the most starkly modern in the area, so modern I could not sell it several years ago. I am not anti-modern. I am anti-bad-design. Wow! I am kindof amazed at the hostility I still feel fifteen years after the fact. I had started out just to link TJIC's post, and here I am in full-blown rant mode. Sorry. A blogger once described the Boston City Hall as "a poured concrete Vogon love poem." I wish I had said that about Peabody Terrace. The other thing excited, young Harvard grad students might find at my site is an excerpt from my novel. This portion is entirely autobiographical (except for not being a girl) and describes my year at Peabody Terrace. Perhaps the scariest potential effect of the proposed health care bills is the negative effect they likely will have on innovation. And if we adopt the bill, we will never know what we have lost. Unlike budgets, which with near certainty will become overdrawn quickly, we will never be able to point to the health care innovation we didn't have. "[I]f all countries squeezed profits in the health sector the way Europe and Canada do, there would be much less global innovation in medical technology. Today, the whole world benefits freely from advances in health technology that are driven largely by the allure of the profitable U.S. market. If the United States joins other nations in having more socialized medicine, the current pace of technology improvements might well grind to a halt." As Rogoff suggests, the nationalized health care systems extolled by progressives have been living off the innovations developed by the "only country without a universal health care system." I wonder how Americans would vote if they were asked if they would be happy freezing medical care at 2005 levels forever? director for Greenwood King Properties. outstripped supply, fueling a run-up in home prices. locale where their contribution to the economy might not be as great. "These are places where only the elite can live," Dr. Glaeser says. This issue is one of those great examples of the statist game to enlarge government. Step 1: Progressives argue for having government restrict land use and implement tight zoning. Step 2: Housing prices skyrocket, enriching the elite and making it tough for ordinary workers to own housing. Step 3: Progressives decry that lack of affordable housing represents a 'market failure' that must be addressed with more regulation. For example, builders in the SF Bay Area are required to sell X number of below market rate 'affordable' homes for every Y homes they sell at market rates. Step 4: Builders costs go up from the new regulations, further reducing supply and increasing prices. And the cycle just repeats, as bad outcomes from government regulation are blamed on free markets, and used to justify more regulation. Here is a trick to try -- every time you see the word "sprawl" in an article, replace it with "affordable housing." It makes for interesting reading. Hat tip to Tom Kirkendall, who runs a great blog in Houston. From Bradley's descriptions"âand from my own experience"âacademia has devolved into a series of now highly routinized acts of flattery, so carefully attended to that one out-of-place word is enough to fracture dozens of egos. One only has to observe the shrill and over-the-top reactions to some of Lawrence Summers recent remarks to have this ring true. I actually have several connections to Harvard. As a high school senior, I was fortunate to have my choice of Ivy League schools, and I chose Princeton over Harvard, in large part because it was obvious even then that the Harvard's graduate schools and faculty egos took precedence over teaching undergraduates. At Princeton I got to know Neil Rudenstine, then provost of Princeton and later President of Harvard. Rudenstine was basically far too good a man to run Harvard, sort of like sending Mother Theresa in to run Haiti. The faculty devoured him, and drove him to a breakdown. More recently, I attended the Harvard Business School (HBS). Many of you who are unfamiliar with Harvard would likely assume that the b-school was the snobbiest and most condescending arm of the university. In fact, the opposite was the case -- the B-school was both isolated from and looked down on by the rest of the university, its isolation reinforced and symbolized by the river that separates HBS from the rest of the campus. Many an outsider have commented on how approachable HBS students and faculty are as compared to the rest of the university, which is ironic since most of the rest of the university, busy polishing their egalitarian credentials, condescendingly denigrate HBS students for being, well, grubby capitalists rather than lofty intellectuals like themselves. As a result, HBS crew teams were routinely booed through the entire Head of the Charles regatta, and HBS graduates are booed by the rest of the university at every graduation ceremony. As a result, Princeton gets much of my time and love and attention and, well, money, while Harvard gets nada. Update: I am reminded that this last feeling about Harvard is not limited to the B-school. My good libertarian college roommate Brink Lindsey (I wish he would start blogging again) tells me that when he was at Harvard Law, a group of his friends formed N.O.P.E., which stood for Not One Penny Ever [to Harvard]. The president of Harvard University prompted criticism for suggesting that innate differences between the sexes could help explain why fewer women succeed in science and math careers. My gut feel, though, without having talked to her, is that the annual giving check is probably not in the mail. By the way, I do think there are innate differences in the sexes - it is almost impossible not to see this having raised kids of both genders. It is also fun to joke about women and math skills - I joke with my wife all the time. However, I am not speaking as the representative of the leading university in the country. Mr. Sommer's remark is pure supposition, without any real research behind it (he admits as much). That said, given that he is in charge of an educational institution whose job is to push people of both sexes up to and beyond their potential, it was a stupid statement from the wrong person. Is this hypocritical on my part - criticizing Mr. Sommers for something I have done myself? No. Here is an analogy: Its may be fun for all of us to joke about French military prowess, or lack thereof (Q: Why are the streets of Paris lined with trees? A: Because the Germans like to march in the shade) but it would be absolutely wrong for the president or the state department to do so in any public venue, because they are representing our country in an official capacity. Mr Sommers is representing Harvard University, and to suggest publicly that half his student body is biologically incapable of being successful in a substantial part of his University's course work is stupid and irresponsible. Virginia Postrel comes to Sommers defense here and here. She argues that Sommers did indeed have quite a bit of good analysis behind him, and that those of us who criticize him are being politically correct and hindering academic inquisitiveness. Hmmm, maybe. I have a lot of respect for Ms. Postrel, so if she says I am missing something, I am willing to think about it some more. However, I will say that all I saw in the write-ups was data that women are underrepresented in math and science related careers (duh) and speculation but no evidence that this may go beyond socialization to biology. The distribution of careers data is loaded with social factors that are really, really hard to control for. Based on the same data, you might come to the conclusion that blacks are biologically less suited to be corporate CEO's or that men are less suited to being nurses or flight attendants. We are in the middle of a radical change with women and education. A wave of women more comfortable with educational and intellectual achievement in general is moving through the system. It is therefore dangerous to read data ahead of the wave - say with 30 and 40 year olds, since everything will change when the wave rolls through. How do I know there is such a wave? If you graduated high school 20 or more years ago, look at the picture of the honor society in the yearbook. Likely as not, the picture will be mostly boys. Now go to just about any high school and look on the wall. Taking my kids to chess tournaments and the like, I have been in a lot of high schools lately, and it is not at all unusual that the pictures of the honor society are ALL girls - not more girls than before, but all girls. Then, take a look at college enrollment and the huge influx of women there. Yes, for various reasons, these women may still not be choosing careers in the sciences, but you can't tell me that they are somehow biologically less prepared to do math. lol, anyway, no more. I have decided to cut Sommers some slack, in part because I obviously don't have all the facts, and in part because I am sympathetic to him since I know for a fact that Harvard University is somewhat less governable than, say, Haiti.